Hi everyone, new here and trying to salvage the data on my drive. Anyways, if you need any information just ask because I really don't know where to start with this. So my problem is that my external HDD was accidentally knocked over when I was reaching for something and since then, accessing data has been EXTREMELY slow. I'm talking about taking minutes to open and play a media file. Another indicator to me that something is wrong with the drive is that whenever I turn on my computer in the morning, this drive has some kind of clicky noise for a bit after startup. Problem right now is how can I go about transferring as much data as possible off this drive? 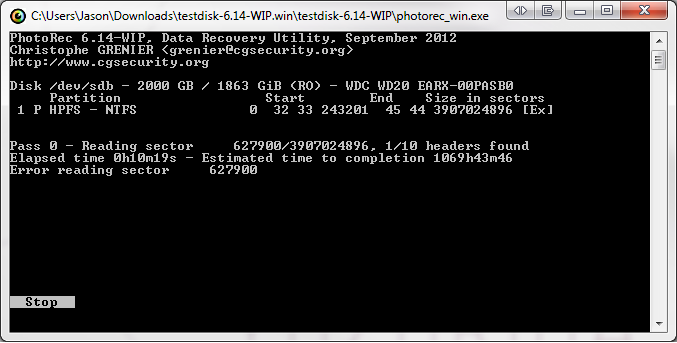 If I try to move the data I get an error that it can not read the disk and when I discovered PhotoRec I decided to try it, but after a while it stops working and minutes later pop up with a new message.